Tangelo buttercream with fluffy white tangelo zest cake, filled with tangelo-vanilla bean pastry cream. Turbinado sugar glitters and honey gleams golden. First instincts are a funny thing. I’ve read that within the first 3 minutes of meeting someone, you’ve picked up on subtle cues that allow you to form a gut reaction, that inexplicable feeling you have about someone that determines if you regard them positively or negatively. Lisa is someone with whom my first instincts spoke loudly and clearly–I liked her right away. Perhaps it was that we were introduced via a mutual friend who shares a similar easy-going nature, perhaps it was her complete lack of pretense, maybe it was her easy smile and a certain wry, knowingness about her . . . whatever it is about Lisa’s recipe, I like it. Yesterday, Lisa asked me if I had time to pull off a cake. A coworker is getting married–hooray!–and they’re having an office celebration and champagne toast–what a lovely thing to do for a co-worker, right? Of course, many people get office celebrations, but usually they involve a half-hearted, icky, supermarket cake and if you’d like something to drink with that, well, there’s the morning’s left over coffee and perhaps someone’s half bottle of Snapple in the fridge. This cake would not be that cake. No, this cake would feature spring flavors: soft, fluffy tangelo zested cake filled with tangelo-vanilla bean pastry cream–soft and orangey and a little bit sweet, with that yummy crunch of vanilla beans! My favorite thing about this cake is rubbing the tangelo zest into the sugar, permeating the cake with its fresh zip. For the frosting, a sunny yellow buttercream–colored by the fresh butter and orange zest. 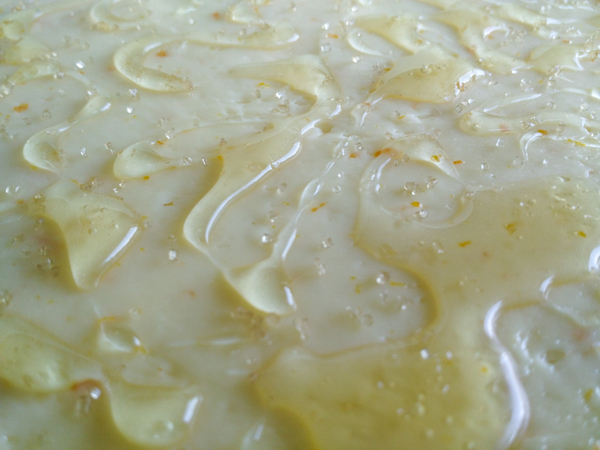 With a hint of orange oil and a suggestion of Patron’s Citronage, this buttercream tastes as lovely to us as the scent of an orange blossom must smell to a spring bee. Honey glistens and adds golden warmth. Of course, with this being a celebration of such a golden event as a wedding, it is simply frosted then “glittered” with lovely, sparkling turbinado sugar–its golden color is as perfect and appealing as its crunch! And of course, the top is delicately drizzled with a fine thread of honey, which adds the warm of the sun to your final forkfuls. Yes, now this is a cake that should be accompanied by champagne! This is how a spring wedding should be celebrated by friends!